Explosive is an apt term to describe the art of Steve Brodner (b.1954), whose deftly executed drawings cast a spotlight on the American political scene as it unfolds before us. Working on a national political stage, Brodner is perhaps the most successful, influential, and widely read of today’s political illustrators. His wry humor and unique ability to conceive visual form inspired by icons of popular culture resonate through our shared cultural memory. Powerful images speak to us with precision and directness, offering fresh perspectives and revealing sometimes painful truths about our world and the influential leaders of our times. 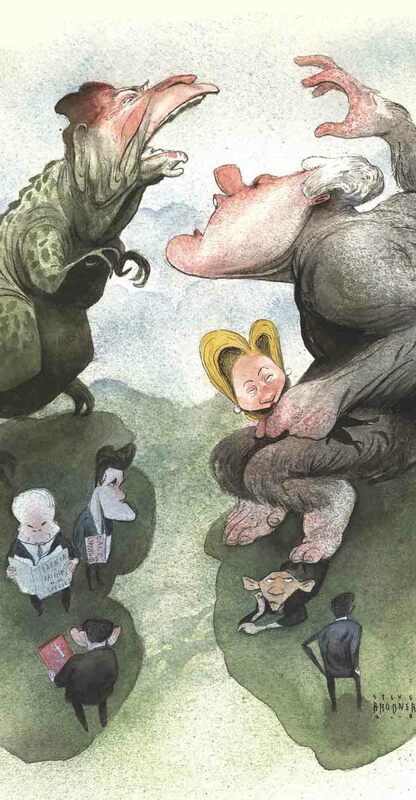 Steve Brodner draws upon a celebrated tradition of political caricature that harks back to the 18th century. 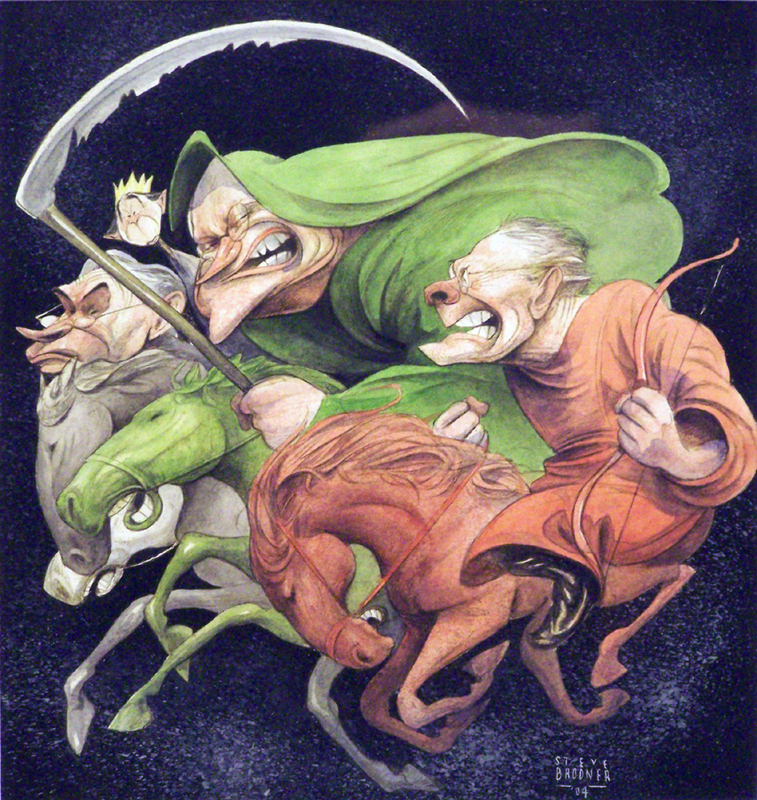 Beginning with the work of English illustrator James Gilray, whose satirical art cast a critical eye on the British government and the governing classes, political illustration has served to inform, motivate, and sometimes incite the public. Today, political illustration continues to serve as a vehicle for communication about the political process because of its mass appeal. During the past two centuries, great cartoonists like Francisco Goya, Honoré Daumier, and Thomas Nast have offered distinctive political and social perspectives, keeping their messages before us through constant innovation and compelling imagery that posed significant questions about the events of their day. Like these landmark figures, Brodner’s art defines and comments upon society, challenging our ideas, and profoundly influences public opinion on a mass scale. Steve Brodner has been a satirical illustrator for over thirty years. Born in Brooklyn, in 1954, he studied art at the Cooper Union in New York City. As a young artist, he entered and won first place in a major illustration competition sponsored by the Population Institute – an award presented by the legendary New York Times caricaturist Al Hirschfeld, who he greatly admired. After graduating from Cooper Union in 1976, he cut his teeth at The Hudson Dispatch, a small newspaper in Union City, New Jersey, where his talent for political satire was first recognized. In 1977, The New York Times Book Review began publishing his art, and from 1979 through 1982, he produced his own journal, The New York Illustrated News. Brodner developed a distinctive style in the early 1980s, and began creating illustrations for nearly every major American periodical of the day. By the end of the decade he emerged as the nation’s foremost political artist, a distinction that he has maintained to this day. The New Yorker’s official political illustrator for the 2008 Presidential campaign, Steve Brodner is an award-winning commentator whose imagery has appeared in such noted periodicals as Esquire, The New York Times, New York, Mother Jones, The Nation, National Lampoon, Rolling Stone, Sports Illustrated, The Washington Post, and The Village Voice, among many others. Steve Brodner describes himself an art journalist. He seeks reporting assignments from national publications, researches topics, and produces compelling images that provoke an emotional response. These are always done in series form to create an expansive visual narrative that speaks to a greater truth. His topics of choice are evidence of society’s most pressing concerns, whether they address the plight of the American farmer, gun violence in our cities, or the machinations of government at the state level. Unlike his overtly political images, satire is not universally present in his art journalism, providing a complete and authentic picture of issues and events. 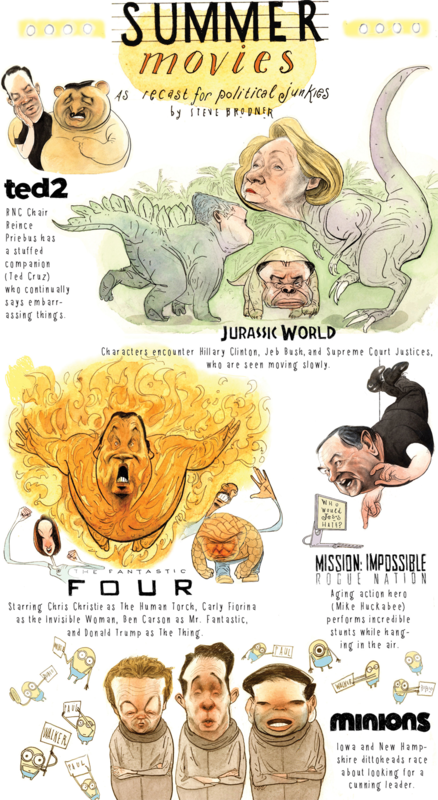 How does a political illustrator create? Steve Brodner begins with a sketch book, crafting portraits of potential subjects in pencil and developing ideas. Like most caricaturists, he exaggerates specifically recognizable features, providing us with a particular frame of reference. Then, he overlays a pop culture reference, creating an instantly understandable image from disparate elements. Though usually humorous, sobering or ironic truths about a particular individual, situation or political event are often evident. Brodner’s powerful character studies provide profound insights into his subjects’ personas, and are sometimes empathetic. For example, 1996 presidential candidate Bob Dole was severely wounded during the Second World War and has limited use of his right arm, yet this issue was never exploited by the candidate. The artist’s images convey a sense of deep respect for his subject, despite his disagreement with Dole’s political philosophy. Over the years Brodner’s representations of key political figures naturally evolve. A case in point is his approach to drawing George W. Bush, who was first represented by the artist in 1998, while he was Governor of Texas. 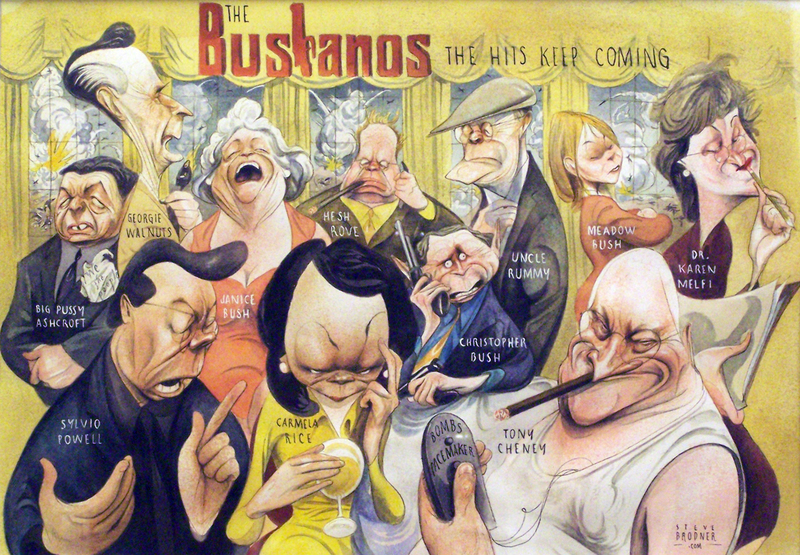 A representational image developed into multiple caricatures, including variations on Mad magazine’s Alfred E. Neuman and on Disney’s Mickey Mouse, culminating in what Brodner describes as “Simple” Bush. This elemental form is created with just a few lines on paper, but is still recognizable as the President. Raw Nerve: The Political Art of Steve Brodner was an exhibition mounted at the Norman Rockwell Museum from June 7 through October 26, 2008. Brodner, Steve. Freedom Fries: The Political Art of Steve Brodner. Seattle, WA: Fantagraphic Books, 2004. Brodner, Steve and Hanoch Piven. Faces: 78 Portraits from Madonna to the Pope. San Francisco, CA: Pomegranate, 2002.